Now with vitamins X Y and Z! Added vitamins! 30% of your RDA Iron! Food labels promise you all sorts of benefits but how much do you need to worry about whether your child is getting his RDA (recommended daily allowance) of vitamins and minerals? 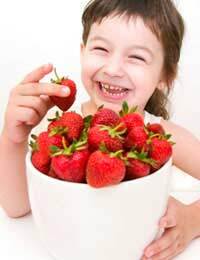 If your child is eating a balanced, well-varied diet, he’ll get them naturally from the food. If, on the other hand, your child is a fussy eater, then you might have to think of ingenious ways to get the missing vitamins into him! How will you know he’s missing them? It might be that he shows physical signs such as being very tired, which could indicate a lack of iron in his diet – but always check out any symptoms with the doctor – or it may just be that you’re aware, for example, that he rarely eats meat and you’re worried that he might become anaemic. You can buy supplements from chemists or health food shops, but the best way to raise your child’s intake is to get him eating foods that are rich in whatever he’s missing. You’ll know that vitamins, minerals and trace elements are all substances that we need in small quantities to ensure that our body works properly. There are two types of vitamins: water-soluble and fat-soluble. Fat-soluble vitamins are mainly found in fatty foods such as animal fats, vegetable oils, dairy foods, liver and oily fish. The body can store these vitamins so, don’t worry, you don’t have to feed the kids on sardines every day! But because the body can build up a store, it is possible to have too much, which can be harmful. Vitamin A is needed for healthy eyes and skin and for growth. It’s found in eggs, milk, spinach, carrots and nectarines. Vitamin D is necessary for strong bones and teeth and is found in milk, fish and eggs. Vitamin E helps maintain healthy body tissue, and is important in the development of red blood cells. It’s present in whole grains, such as wheat and oats, leafy green vegetables, sardines, egg yolks and nuts. Vitamin K helps blood clot, important when you have a cut. It’s to be found in leafy green vegetables, liver, pork and dairy products. Water-soluble vitamins need to be ingested every day as any excess isn’t stored but is passed out of the body in the urine. They’re found mainly in fruit, vegetables and grains. Vitamin C helps you fight infection, it helps wounds heal and it helps maintain body tissue. It’s one of the best-known vitamins and you’ll find it in citrus fruits, strawberries, broccoli, cabbage and tomatoes. Vitamin B comprises a whole group of vitamins including B1, B2, B6, B12, niacin, folic acid, biotin and pantothenic acid. Like Vitamin E it helps make red blood cells, but its prime task is to provide energy when you need it. Whole grains, seafood, poultry, meat, eggs, leafy green vegetables, beans and peas, dairy products and citrus fruits are all good sources. Minerals and trace elements (minerals that you need just a trace of) are also needed in tiny amounts to ensure your well-being. They are necessary to: build strong bones and teeth; turn the food you eat into energy; the production of haemoglobin in red blood cells; keep your muscles and nervous system working properly; help your immune system. Calcium and iron are the best-known minerals while fluoride and zinc are two of the more familiar trace elements. Minerals are found, in varying amounts, in meat, fish, cereals, milk and dairy foods, vegetables, fruit and nuts. It’s amazing but most kids somehow get enough vitamins and minerals from their diet, even when it’s not perfectly balanced. Many breakfast cereals and other foods aimed at children contain added vitamins and minerals, and it’s not usually necessary to worry about them. However if you have any concerns about your child, talk to your doctor, or arrange to see the health visitor. They’ll be able to reassure you or give you advice or help as required.